The Caribbean side of the island, Rincon, Puerto Rico. The map shows Puerto Rico, one of the Greater Antilles islands in the Caribbean, with the Atlantic Ocean to the north and the Caribbean Sea in south. Puerto Rico lies approximately 1,600 km (1,000 mi) south east of Miami, Florida. The island is separated from Hispaniola island (shared by the Dominican Republic and Haiti) by the Mona Passage in west. 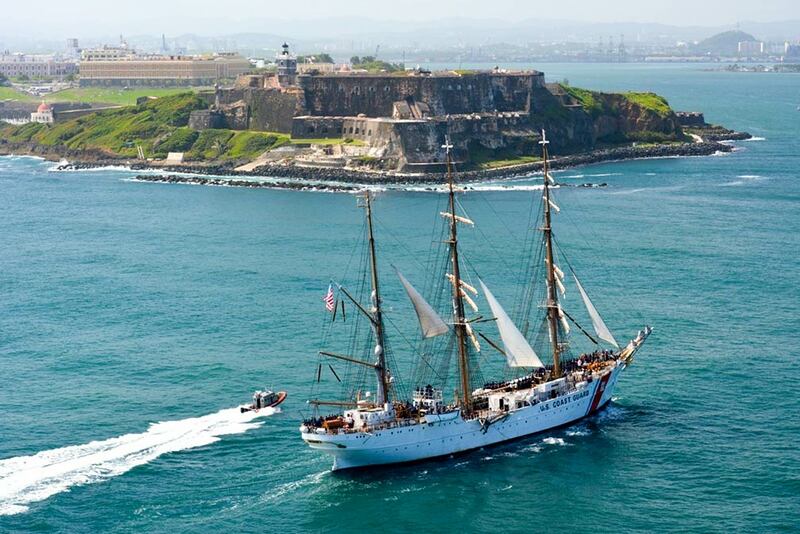 U.S Coast Guard Barque EAGLE on its way to San Juan, Puerto Rico, in background the 16th-century Castillo San Felipe del Morro. Christopher Columbus discovered the island in 1493 and claimed it immediately for the Spanish Crown, despite the fact that the local Taíno people already called it their home. The island became one of the earliest Spanish settlements in the New World. The inhabitants of today are descendants of Spanish colonists, mixed with Indians and imported Africans slaves. Puerto Rico's landscape is mostly mountainous with a coastal plain belt in north, sandy beaches along most coastal areas, and a tropical rainforest in northeast, the El Yunque National Forest on the slopes of the Sierra de Luquillo mountains is the United States' only tropical rainforest. The island's highest point is Cerro de Punta at 1,338 m, located in the Cordillera Central. The island has a land area of 8,870 km², compared Puerto Rico is slightly smaller than Cyprus or slightly more than three times the size of the US state of Rhode Island. The self-governing unincorporated territory of the United States, has a population of 3.47 million people (in 2015). People born in Puerto Rico are natural-born citizens of the United States. The national capital and largest city is San Juan. Official languages are Spanish and English. The map shows the island with cities, expressways, main roads and streets, Luis Munoz Marin International Airport in San Juan. Zoom out to see the location of Puerto Rico within the Caribbean. (Estado Libre Asociado de Puerto Rico).